A 1927 Oakland with a Pontiac engine in the hands of a Californian who likes to make period-correct surfboards and use that car as a surf wagon. Call me crazy but I love it. Mr. Brian Bent keeps things old school. When he got his '27 Oakland, he moved the Pontiac flathead up to improve cooling, built a clutch and tested the wooden spokes a bit just to make sure it will hold at high speeds. 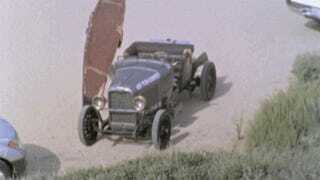 Nowadays, he drives an almost 90 years-old parallel leaf racer to the beach and to fast food joints. That's California for you!